Facebook Messenger Scam are great i'm sure for the scammer but you can feel a little foolish and out of pocket when scammed. There is nothing worse than been scammed. The only thing that is worse is when your gut tells you something is wrong and you don't listen to it. This is exactly what happens last Friday evening. Sitting down relaxing and a message appears on the phone. It was from a friend on Facebook. I wouldn't interact on Facebook that much and seldom on Facebook messenger. Yet I got sucked in and fell for it. The Facebook Messenger Scam Introduction. The message, from a Facebook friend requesting a favor. Asked me for my mobile phone number (not linked to my Facebook account). Said that I would receive two text messages and could I let the friend know the pin. That it wouldn't cost me a penny. I forwarded off my number and asked how things were with the person and their family. 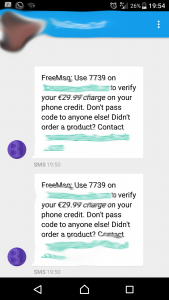 I received another text saying "Vodafone, yes all well"
Falling For A Friendly Face. As you do, I had said YES (and YOU shouldn't). In the mean time I had gone quickly on line to check for scams as I suspected something was wrong. Another text arrived, instilling a sense of urgency "did you get the pin yet". I checked my SMS, and what I saw should had stopped me straight away. Yet human relationships rely on trust and Facebook Messenger Scam operators know this. I sent the person the pin and a message came back saying it didn't work. I received another two messages with a pin via SMS and a final thank you from the scammer. Ok, I've been done, burgled, robbed. Next day when I checked Facebook the friend had posted saying their account had been hacked. Now is time to spread the Facebook Messenger Scam and stop it happening. If you receive a Facebook Messenger Scam message from a friend there are a few harmless questions you can ask without the scammer knowing and avoid being scammed. Ask them how is Fred (Their dead dog)? If it is a friend they should respond with, he died. the scammer will probably say fine to continue on the scam. If your friend has no kids, ask them, How are the kids? Your friend will think you are mad and respond back accordingly, yet the scammer will play on with the scam. From experience, the Facebook Messenger Scam got me good. Subconsciously aware of a risk, once presented as a friendly face asking you for assistance it is so easy to fall into the trap. Your friend, Facebook, Messenger, your phone company or the site that send you the pin are not responsible and have no liability for this scam. They are simply providing a service which you accept. The scammer is the one who will benefit the most. We have contacted the third party companies on the understanding of spreading the word and stopping these scams. Other phone scams to be aware of click this link.